If you would like to interview Trapper Jeff Norris or Christy Norris for more information about this business, nuisance wildlife, animal trapping or general wildlife commentary for a news story, please call or contact us through the web site. Sun City Center -- A Manatee County wildlife trapper says opossums are causing damage in one community. "I was scared to death because it was aggressive," said resident Letitia Rupert. A wildlife trapper found an aggressive, pregnant opossum behind Rupert's vent Friday. The animal was tearing up insulation in the house in Laurel Woods. "Basically what they are doing is reaching up there and ripping it down. They get up there, in between the flooring and the installation and, that is where they give birth," said trapper Jeff Norris. Rupert's home isn't the only one. Norris said he's had a surge of calls and set up a trap at a house just a few blocks away. "They can hurt you. They can bite you, they have some sharp teeth," Norris said. Rupert thinks the animal could have come from a canal that's just yards from her house. "That seems to draw the animals," Rupert said. It could be the canal or construction from a sound barrier that just went up. Experts say construction projects sometimes force wild animals into nearby neighborhoods. "Wildlife gets disturbed and it's got to go somewhere," Norris said. For Rupert, that somewhere was in her home, tearing up the insulation, looking for a place to live. "Hopefully they won't get any worse," Rupert joked. Spend some time thinking like a critter. Get down on their level and see if you can locate any places where pests can get into your house, under your house, through your walls or into your attic. Check siding to see that there are no holes or cracks. Look at your windows and doors and check to see if there are any gaps in the seals. You may want to use a mirror to look at the underside of your siding or in low areas. Also remember that mice can squeeze through very small openings. One rule of thumb is that if you can slide a pencil through a hole or crack then a mouse can fit through it. A flashlight is also very useful while conducting your exterior examination as it can illuminate otherwise overlooked entrance sites. Inspect pipes, cables and anything else that penetrates your walls and look for openings. Search out vents, exhaust fans, dryer vents and chimneys and check for proper screening, chimney caps, etc. As you conduct your initial examination look for evidence of an infestation (trails, droppings, damaged wood or sawdust, termite mounds, fur, etc.). If you locate such evidence then it behooves you to locate the pests themselves. Eradicating the pests can be as simple as chasing them out of your house or may be very involved and require professional help. It is important to remove all pests before sealing up your house so that you do not inadvertently trap them inside your homes. There is nothing worse than a raccoon or possum that crawls under a house and then dies. The odor can drive you from your home until the decaying carcass is removed (and that, as you can imagine, is not a fun job). After you have located holes and cracks that may allow pests to enter and eradicated all the pests from inside your home, under your home, in your attic, etc., then it is time to seal up the entrances. Using caulk (acrylic for small cracks, polyurethane for larger ones) you seal many of the cracks. Expanding foam works great to seal off the bigger cracks, gaps and holes. However, rodents can chew through it pretty easily. To thwart this, simply stuff the gaps with copper mesh (such as Chore Boy scrubbing pads) prior to applying the expanding foam. You can also use steel wool. However, it can eventually rust away, and so copper is a better choice. If you do not already have chimney caps, then add them as they prevent birds and rodents from taking up residence in your chimney. Dryer vent screens or flaps are also necessary to prevent critters from getting into your dryer. Walk around the outside of your house and cut back shrubbery that is against the house. Rake away debris and mulch from the foundation. Move woodpiles (a haven for destructive insects and rodents) away from your house. Clean out gutters and keep them clear. Make sure downspouts direct water away from your house and assure you have splash blocks or downspout extensions. Also, remove any source of standing water -- remember insects and animals need water to survive. If you have pets, make sure you store your pet food in sealed containers. Metal trash cans with lids work well to keep out mice. Removing clutter reduces food sources and hiding places for pests -- spend some time cleaning up your basement, attic, food storage areas, and other areas that need it. Following these simple steps will help assure that all of the guests you have this holiday season are invited and welcome. Florida -- Brazilian free-tailed bats are plentiful in Florida, also home to 12 other bat species, according to Bill Kern, associate professor of urban entomology at the University of Florida's Fort Lauderdale Research and Education Center. They consume moths, flies, beetles and mosquitoes and are the primary predator of night-flying insects. While some use "Mexican free-tailed" and "Brazilian free-tailed" interchangeably, there's a difference in the bats, Kern wrote on UF's Florida Wildlife Extension website. "Our southeastern free-tailed bat differs in two very important ways from the Mexican subspecies: Our free-tailed bats do not migrate and are never found in caves," Kern wrote. "The Mexican free-tailed bat migrates to Mexico in the fall and returns north in the spring and is one of the most abundant species in caves." And don't worry if you see a bat headed your way. It's a misconception that all of the maligned mammals carry rabies: Less than 0.5 percent carry the disease, according to Florida Wildlife Extension. Rather than being the stereotypically scary creature, the type found quite often serves a great purpose, said Susan Kwasniak, marketing director for Bat Conservation International. According to its website, the Texas-based group conducts and supports science-based conservation efforts worldwide. In Texas, the Mexican free-tailed species consumes countless insects regarded as agricultural pests, including the cotton boll worm moth, and also eats insects over woodlands and forests, Kwasniak said. About 100 million Mexican free-tailed bats live in Central Texas caves. Usually, they are in the 3- to 6-foot length and no big deal. But on Thursday, Hunt got a call that a Myakka City homeowner had discovered a snake in her driveway. What Hunt found was shocking: a 10-foot albino Burmese python. "It's something that would scare you if you stumbled upon it at night," said Hunt, a field supervisor at Nuisance Wildlife Removal in Ellenton. The company received a call about 9:30 p.m. Thursday from the Manatee County Sheriff's Office to respond to the residence in Myakka City. The home where the snake was found is off Crosby and Verna Bethany roads in Myakka City in an area of ranchettes and homes on large lots. The people who found the snake had corralled it into a box. Hunt had planned to put the snake in a tank he carries, but the tank was too small, so he taped up the box and took it back to his workplace. Jeff Norris, president of Nuisance Wildlife Removal, said he and Hunt chuckled when they first got the call that someone had found a 10-foot python. Not until they saw the creature were they convinced. Later, they took a photo of four men holding the snake. "This is really an usual thing," said Norris, whose Web site is floridawildlifetrapper.com. "I would imagine it was someone's pet; either it escaped or someone got tired of it and turned it loose." The Burmese python is on the Florida Fish and Wildlife Conservation Commission "reptiles of concern" list and is required to have a microchip placed in it that identifies the owner. Python owners must get a state permit before they can buy the snake. Nuisance Wildlife Removal is planning to scan the python to determine if it has a microchip and learn who might own it. Gary Morse, a spokesman for the fish and wildlife commission, said pet owners are required to report when they lose a pet that is listed on the "reptiles of concern" list. He said if a pet owner is located from microchip information, he or she could be fined. If no owner is found, the striking yellow and white python could be euthanized, he said. "You don't just find an albino Burmese python running around," Morse said. "In this case, the snake running around would be a violation." Morse said pet snakes sometimes become a burden on owners. "They get expensive," he said. "The owners become afraid of them or they can't handle them." The agency, he said, is working to form an adoption network that would allow Floridians to adopt non-native pets that owners no longer want. MANATEE COUNTY (Bay News 9) -- A lizard, not native to Florida, found in Manatee County could be the start of trouble for farmers. Farmer Mike Martinez originally thought raccoons were nibbling on his crops. "They were eating all of my vegetables, so I had to cut back you know," he said. Martinez caught the culprit in a raccoon trap. Matthew Hunt with Nuisance Wildlife Relocation was stumped by what he saw. "I had to look through my encyclopedia on reptiles to try to figure out what he was," he said. It turns out, the culprit was a Tegu, a lizard that can grow up to four feet long. "This is my first encounter with a wild Tegu in this area," Hunt said. Hunt says Florida's tropical climate is well suited for the Argentinean lizard. They have such a wide variety of food source they can thrive very well," Hunt said. The species of lizard can lay up to 32 eggs at a time. Five of them have already been spotted in northeastern Manatee County, so there's the potential to see a lot more. That makes Martinez very nervous. "That's another problem we're gonna have," he said. "So, we're going to keep an eye on what we see." The lizards have made sporadic appearances on the farm over the past seven months. "This is a young adult," Hunt said. "The others were juveniles, so there's probably been a nesting and now they're habitating." Hunt says in the next couple of years, Manatee County could very well see a surge of these super lizards. Since the tegu is not native to the area, it is not protected under state law. However, wildlife experts say anyone who spots one should call a professional to remove it. The lizards can bite and scratch. They're also know to use their tail as a whip. MYAKKA, FL. - Some unwanted reptiles are causing some big problems for one Suncoast city. It's something you expect to see in the jungle or in a nightmare, and they are popping up more and more in our backyards. They are not only dangerous to us, but also to our wildlife. A 10-foot Burmese Python slithered across the driveway of a Myakka home late last week. After calling 911, Matthew Hunt with Nuisance Wildlife Relocation was sent to retrieve the snake. Hunt says this snake was a pet that somebody let go. Hunt says, "The number one problem we are going to have with these is the eco-damage. The problem they cause to our environment. They really have no predators other than us, so when they come into an environment they pretty much wipe out the natural wildlife." This is the third snake Hunt has picked up this year. In the same week, he also caught a Tegu Lizard that was almost 3-feet long. These reptiles and they're offspring are causing so much concern, that they've slithered their way into Florida law. The snake will be scanned for a microchip to try and locate an owner. If the owner is not found, Nuisance Wildlife hopes to give the Python a useful job. If you do come across one of these slithery creatures do not try to capture it yourself. You can call your local wildlife trapper. A 10-foot Albino Burmese Python was headed down Diana Ballard’s Myakka City driveway late Thursday night when her sister-in-law pulled in behind it. “She called me and I thought she was playing a joke on me, but of course I went out there and it was real,” Ballard said. The snake was fairly docile and stopped moving once everyone began training their flashlights on it. Before long, some friends grabbed it and put it in a truck toolbox. The python had some cuts on its head like it had been in the wild for a while, but it is likely a released pet, said Jeff Norris, of Nuisance Wildlife Relocation in Ellenton, the company that retrieved the snake. Experts say Burmese pythons are breeding in the Everglades and moving north but snakes found this far north are likely released pets. Norris said he’s trying to see if the Albino Burmese python has a microchip to determine who owns the snake. A new law that went into effect in January requires owners of certain snakes of concern, such as the Burmese python, to get a microchip and pay a $100 permit fee. Norris said if the snake doesn’t have a microchip, his company will apply for a permit to keep the snake and use it for educational purposes. BRADENTON – Police and wildlife rescue workers responded to a call Monday evening about a python discovered in a recently rented home in the 1600 block of 18th Avenue Drive West. Matthew Hunt of the Nuisance Wildlife Removal Team found the 4-foot-long snake beneath a water heater and safely removed it. Earlier this month, Justin Matthews of Matthews Wildlife Rescue recovered a 13-foot python that had been seen in the parking lot of the Wal-Mart on State Road 64. The pythons are most likely escaped pets. Wildlife rescuers discourage people from buying pythons and warn that it is illegal to release the non-native snakes in Florida. Hurricane Charley made landfall in Florida on Aug. 13, 2004, but we are still feeling the environmental repercussions. I remember hearing the news that Charley was going to make landfall in Port Charlotte, Fla., which is in our service area. My wife, Christy, and I discussed how busy we'd be because the area was probably going to be rife with wildlife invasions, thanks to all of the damage and wildlife displacement. Boy, were we wrong. Wildlife invasions were the last thing on people's minds. Houses were damaged so badly that even if we were able to retrieve the animals, they would just find other places to get in to. Later, most of the animals and wildlife left on their own because of all of the noise and commotion from rebuilding and renovation work. This brings us to our current problem: Almost everyone was so focused on structural damage, hardly anyone thought about the environmental impact that Charley would have. Not only were residences and commercial buildings destroyed, but so were all of the homes for wildlife. Many animals did not find their way to safety, thus drastically reducing the populations for many wildlife species. For instance, we lost an enormous amount of squirrel nests because of all the trees that were destroyed. For the first couple of years after Charley we did not receive very many squirrel jobs at all. Then came the fall 2006, when wildlife came back with a vengeance. I haven't seen so many squirrels in all my life. My company was handling more jobs from these little rodents in two days than we had tackled the entire year before. We were literally going nuts with these calls, and they haven't stopped yet. The reason why is because while we can replace structural damage, only Mother Nature can grow the trees — thus leaving squirrels few options other than to invade commercial and residential dwellings. The problem lies in that squirrels are one of the most destructive species of wildlife in Florida. They are from the rodent family and need to chew to survive. Their incisors continually grow and need to be filed down. After all, it's not like squirrels can walk into a veterinarians' offices and say, "I need a trim." So, they chew on things like the wood on homes, wires in attics and almost anything else they can get to. I have seen houses that had so much damage on fascia board that I wondered whether the wind blew inside, or if they had leaks. I have seen wires so chewed that I told the customers they needed electricians to fix them before re-entering the buildings. One customer in Sun City Center, Fla., had a squirrel that chewed the pipes in his attic. He called a plumber to repair the leak, and called me to get the squirrel. So I set some traps and left. The next morning, I got a call first thing saying that there was a problem. I went back to the account and could not believe my eyes: This squirrel had chewed another hole a mere 6 inches from the previous hole, which then flooded the condo. The water damage was so bad, the ceiling had fallen into a bedroom and all of the furniture was ruined. Still, the customer was happy that the little critter was in the trap. So, with all of the storms the Gulf Coast has had in the past few years, squirrel populations are back stronger than ever. It took a few years, but I'm finally getting all of the wildlife calls I expected when Charley first hit. When Hurricane Charley hit Florida in August 2004, it was the strongest hurricane to reach the United States since Hurricane Andrew, 12 years earlier. With winds recorded at more than 150 mph, Category 4 Hurricane Charley caused more than $15 billion in damage and 10 casualties, making it the fourth costliest hurricane in United States history. Isn't it fascinating how Mother Nature adapts and changes things so wildlife species can survive and thrive in this delicate environment in which we live? You can reach Jeff Norris, president of Nuisance Wildlife Removal in Palmetto, Fla., at 941-729-2103 or jeff@flnwr.com. A Suncoast woman gets a slithering surprise. A six-foot Burmese python showed up in a Bradenton woman's garage. Jeff Norris of Nuisance Wildlife Removal was called to the rescue. He says the Burmese python wrapped itself around the woman's car engine, and wouldn't let go. "It's just always a challenge with a constrictor because they wrap themselves around everything, and it's not just reach in grab it and get it out," says Norris. After 2 hours of carefully prying the 6 foot python off the engine, Norris and his technician finally rescued the snake. Norris says he's seeing a lot more of these domesticated snakes showing up in homes on the Suncoast. "A lot of people are being irresponsible with their pets, letting them go in the ponds and wooded area and stuff. These animals are not used to fending for themselves and they're seeking shelter," says Norris. Norris also says when the weather starts to cool down these cold-blooded reptiles head for the heat. "These snakes are going in there, in the garge, to warm up because they have to have heat to survive," says Norris. Matt Hunter, who works with Norris, says you have to be careful when dealing with pythons. "You got to be careful not to hurt the snake. It's just one big continuous muscle. Use precaution of course, not to let him bite you, because once he locks down then he'll twist around you and constrict," says Hunter. Which is why Norris suggests calling a professional to do the job. "You don't know what he ate (snake)...he could have ate a rat last that had any sort of disease and that's transferrable," says Norris. Norris says the Florida Wildlife Commission will decide the fate of the snake. He suggests if you have a snake and you can't handle it's size, try and take it back to where you got it from. Norris says when the snakes are released into the wild they prey on some of Florida's protected species. Matthew Hunt of the Nuisance Wildlife Removal Team found the 4-foot snake beneath a water heater and safely removed it. There's a stiff penalty for pigs rooting up yards in Manatee County, serving time at the Manatee County Jail farm. It's a life sentence for wild hogs after they were trapped and taken to jail after destroying yards in Manatee County neighborhoods. Ridgewood resident Virginia Heatley said this isn't the first times the hogs have hit. "It started here in the backyard closer to the house," Heatley said. But there's good reason the hogs are on the move. Booming growth in north Manatee is forcing them out of their natural environment. It's a problem Jeff Norris with Nuisance Wildlife Removal deals with almost daily. "I've seen acres upon acres torn up in certain areas," Norris said. So Norris sets up corn-filled traps in hopes of catching the culprits who have no place to go but the pen. "Well, Florida statute says we cannot release any non-indigenous species into the wild," Norris said. So it's off to jail for the hogs and back to some serious yard work for residents like Heatley. "It's hard to put it back together again," Heatley said. It doesn't cost the jail anything to house the hogs. They're fed leftover food from the inmates along with grain, a byproduct of grits made at the farm. Once they're plump, you'll likely find them at a barbecue. The Manatee County Jail farm has a meat processing plant run by inmates. Many times nuisance wildlife relocation will pay to have a few hogs processed. The meat then goes to needy families in the area. Osprey, Florida - A school for gifted students in Sarasota County is trying to keep bats away from its media center, after a bat tested positive for rabies. Christine Norris with Nuisance Wildlife Removal is using nets on parts of the walls at Pine View School in Osprey. The nets will let bats out from under flashing, but not let them back in. A science teacher removed a bat on a wall during a lunch period to keep it away from students. It’s the second time this year a bat in Sarasota County has tested positive for rabies. In 2006, there was one case all year. The Sarasota County Health Department and Pine View School administrators are reminding people to keep away from bats, raccoons and other wildlife that carry rabies. * How a self-described redneck built a half-million-dollar business. YOU GOT YOUR RATS ON THE WEST SIDE. WILD PIGS UPTOWN. Just name the vermin, and it’s a good bet Jeff Norris has seen it, captured it, then released it or killed it. 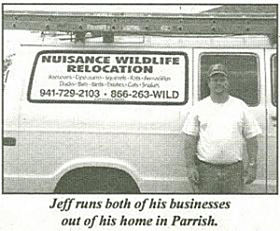 His company, Nuisance Wildlife Removal, is a far cry from your typical business success story. No venture capital, no board of directors, no suits, ties or skirts, and no college degrees weighing down the walls. “This is a redneck’s dream job,” Norris says, comfy in a ball cap and neat khakis. You could say Norris is a redneck with a good eye for business, receptive to technology and okay with sweat, stink and quick thinking. The 39-year-old started his Parrish-based animal trapping company a little more than 10 years ago. His former father-in-law, who worked for Animal Services of Manatee County, saw the need for trappers and nudged Norris to jump in. Animal Services gets lots of calls for pesky armadillos, rats and alligators, but can only respond to dog and cat calls. For any other nuisance critters, homeowners are on their own. Back to trapping: Norris gets paid by “the situation.” He charges about $85 to set a trap for one animal. Each additional animal caught runs about $50 more. Nuisance Wildlife Removal operates out of Norris’ home, which has plenty of land for trucks and trap storage. His newest venture is a welding fabrication shop he opened with a partner to build custom-made animal traps in Ellenton. “We improvise a lot, in fact so much that I opened the shop,” Norris says. He’ll use some traps for himself and sell the others. The one question Norris gets asked the most is “do you do gators?” Well, he did. For about a year. But there’s not a lot of money in gators, and it’s bad PR, Norris says, because everyone knows the gator ends up dead. Not only that, “it’s a very dirty, nasty, almost underground business.” What the company traps most is wild hogs, raccoons, rats, bats, squirrels, armadillos and snakes. The squirrel calls dropped to about ten a year after Florida’s string of hurricanes wiped out the acorn supply, Norris says, but now he gets about ten calls a day. “They’ve come back with a hard vengeance.” Development also has a big impact, particularly on wild hogs in Manatee County. “The greater impact is two or three years down the road, when the houses are already built.” And you never know what a day of trapping might bring: Norris once pulled a four-foot green iguana from behind a wall, wrestled Muscovy ducks from a chimney, had a ceiling cave in from squirrel munching, been cornered in an attic by a raccoon, was chased by a wild hog and rescued a raccoon from a telephone pole. Besides staying connected to his home office with a laptop and wireless Internet connection, Norris uses technology to scout out the critters hiding in homes. “We went from putting our ear against the wall to using stethoscopes, borescopes and infrared heat detectors to find animals in the walls,” he says, “versus trying to listen and guess.” Ultraviolet lights are used to track animal urine, and predator scent applications are sometimes needed to uproot and disperse unwanted animals. Technology also helps when it comes to finding employees. Norris likes to post job openings via the Web. “You can cover a lot of people with no money.” Oftentimes, no matter how much technological help you have, it comes down to experience. Critter Catcher Does Work With A "Heart"
Article from the "Parrish Village News"
How in the world does a person get in the business of nuisance wildlife control and also pest control? In talking with Jeff Norris, he told me, "I had a friend in animal control and saw a need for the business." 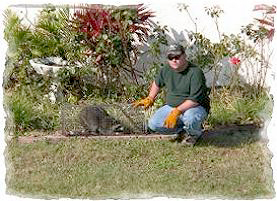 Jeff in his Nuisance Wildlife Removal business helps people who have problems with all sorts of animals: armadillos, raccoons, opossums, squirrels, rats, ducks, bats, birds, exotics, cats, snakes, wild boar, skunks, woodpeckers and almost any other animal except alligators. When he catches the "critter," he tries his best to relocate it to a habitat more suited for its needs away from development and people. That makes people feel good about getting rid of the nuisance animal. When asked what animal seems to be the worst pest, Jeff replied,"It's the raccoon. I get at least 10 calls per week for raccoons that generally cause mischief to people and their neighbors. I have rescued them from attics, telephone poles, vents and even in walls." Jeff did add, however, "The most difficult animals to catch are bobcats and armadillos. Sometimes the animal has already wandered away by the time I am called." Jeff is licensed and insured in Manatee, Charlotte, Sarasota and Southern Hillsborough Counties. Since the counties won't do this type of business, there is a real need for Jeff's expertise. Many of the "critters" are causing property damage and must be removed. He has been in the business for six years. He is a natural outdoorsman. He has trapped, hunted, and fished all his life, enjoying the outdoors and the wildlife. Jeff is not alone in the business. His wife, Christy, monitors the phones, books the calls and keeps the books. While tending her young baby she is busily chatting away with customers on the phone and querying them as to what their difficulty is. She gathers all the information and then sends Jeff or one of his employees to do the task, capture and relocation. Christy is also active in the FLWCA (Florida Wildlife Control Association). She is secretary of the organization. This involvement helps keep them both educated on the trapper's associations, current legislation and relocation versus destruction. They are both members of the NWCOA (National Wildlife Control Operators Association). In Jeff's kind of business there is no rest for the weary. His operation is 24/7. "People call all times of the day dependant on their particular kind of trouble." He gives more serious calls priority. He also knows his business and the predictability of some of the calls. When it has been dry, and there is suddenly a lot of rain, people call. When there is a full moon the call rate increases. So he can arrange his schedule accordingly and know when to expect heavy business activity. The pest control business seemed a natural adjunct to the Nuisance Relocation Control. He is licensed and his employees have a combined thirty years experience in the business. Norris Exterminating, Inc. offers pest control services both in residential and commercial areas. The way he likes to look at the two businesses is best described as "integrated pest management". He offers a customer a complete service--both nuisance animal removal and pest control. It's like one-stop shopping for these kinds of services.The wealth of knowledge he possesses is unusual. He showed me his library of books on the subject and spouted off lots of bits and pieces of information that one would only know through study and experience. For instance, armadillos like grubs. If you have them in your lawn, then you are a likely candidate for armadillo activity. He also told me that often people treat their lawns, but forget about the flowered areas which can also have grubs. You must treat the entire area around your home to avoid an armadillo invasion. Armadillos also like vibration--like pool pumps, air conditioning units, green electrical boxes, and palm trees. His advice is to look around these items if you have them in your yard and look for any activity that could be caused by armadillos. Then take preventative action rather than wait for the armadillo to do some real damage. Jeff laughed and said that "he turned his hobby of outdoor work with wildlife into a business that would provide him enjoyment." He also like the aspect that he can release many of the animals he catches and relocate them where they have a chance to survive. He did say with so many new developments coming into the area, it's becoming harder for the wildlife to find suitable areas for their habitats. Jeff said he has seem almost everything in his line of business. One time there was on older lady who was relocating. She had a cat. When the cat saw all the activity in the house, it became scared and tore a hole in the dry wall beneath her bathtub. The cat hid in the farthest corner and would not come out. Jeff went in after the frantic call and rescued the cat and reunited it with its owner. He still receives a card at Christmas from the happy cat owner. Jeff is different from an ordinary "critter catcher" because he really loves the animals and hopes to rescue every one he can and then release it back into the wild. 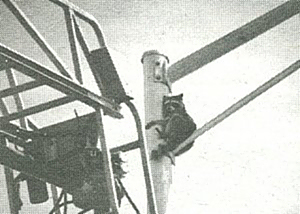 When asked to help get the raccoon atop the telephone pole, he gladly responded knowing there was no way the raccoon could get down alone. That was one scared raccoon! Jeff climbed up the extension ladder with a net and got as close to the raccoon as possible in order to snare it and and then safely get it down. He is not your ordinary "trapper." He is much more. With a kind heart and a willingness to help his customers with a problem, he conscientiously goes about his business of capturing and releasing the animals so they can at least hope for better days!